Gerald of Wales was born at Monorbier castle, in Pembrokeshire, in 1146. He was educated at Gloucester and Paris, and became Archdeacon of Brecon in 1175. He visited Ireland in 1183, 1185, 1199 and again for about two years from 1204. A version of his text--which is largely concerned with the marvellous things he saw or heard about there--is known to have been read publicly in 1188. This manuscript was written perhaps at Lincoln, probably before Gerald's death in 1223, and it has been suggested that he personally supervised its writing and decoration. This manuscript was later owned by St. Augustine's Abbey, Canterbury. 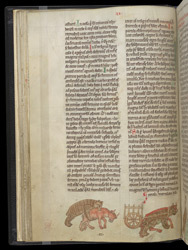 These drawings illustrate the following legend: the body of a St. Firmin was being transported on a cart pulled by two oxen, but when the oxen were unyoked to graze, a bear attacked and killed one of them; on discovering this, St. Firmin's nephew ordered the bear to be yoked in place of the ox, and it helped to pull the cart.